Opportunity doesn’t always come in seductive, unputdownable packaging. It simply shows up. It is up to you to pick it up and allow it to make something out of you. Now, whether or not you immediately make something material out of that opportunity, you can be sure of growing and learning from the experience. Earlier this week, while clearing some 20-year-old files, I stumbled upon papers related to an aborted project I had led in the early 90s. They brought back a rash of memories and learnings! I used to be a business journalist (working for Living Media – the publishers of India Today and Business Today) then. Meeting CEOs was part of my daily drill. One such CEO was a much sought-after yet redoubtable takeover tycoon. At the end of our interview, he offered me a job that I couldn’t refuse – to head his proposed Direct-to-Home television venture. At that time, even cable TV was new in India. Most people did not know of a TV channel beyond the state-run Doordarshan. Zee TV and ABN were the only two private channels available via cable – their presence too was restricted to the metros and mini-metros. I was hardly 27. It was unheard of in Indian media circles then for someone that young to be offered the job of the President of a company. And more important for someone to actually accept it! I remember that on the eve of my taking over my new role, a few journalist friends of mine, sat me down at the Bengaluru Press Club – a famous watering hole for journos then and now – and advised me how ‘risky’ it was take such an “insecure” job with a man/organization, whose background and intention were questionable. But I pressed on. I must confess I was blinded by ambition. My business card that read ‘President’ and the corporate American Express Credit Card were my most prized possessions then! Of course, I was also lured into the job for the sheer ‘adventure’ in exploring two areas about which I had no clue – television as a medium/business and the building a team/organization. I simply dared and took the plunge. I cobbled together a passionate but unsung team and we achieved our first target of preparing a project report in a record 100 days on setting up a DTH service in India – complete with a business plan, a slew of memoranda of understanding with global satellite companies and software (content) production houses and with a guide on how to work the labyrinth of broadcast regulation then prevalent in India. DTH in India in the 90s was unthinkable. It, in fact, eventually arrived only in the mid 2000s and is the only broadcast medium in India today! Much to the shock and surprise of me and my team, even as were ready to present our project report to our principals, the tycoon went bust __ and missing! Media reported that he had vanished after ripping off the assets of all the companies he had acquired. Several cases and investigations were launched against him. Crucially me and my team were not paid our salary dues! My honeymoon with corporate stardom lasted barely 100 days! In a flash, I was out of job. And my media friends, both offline and in print, opined on the ‘pitfalls of ambition and greed’. I remember sulking and refusing to even come out of my bedroom for over three months after this ‘debacle’ __ unable to face either my family or friends or the world! It wasn’t until my former employer from Business Today called me back that I found the courage to emerge from hibernation! When I reached his office in New Delhi, to rejoin my position on his team, I saw a poster on the wall behind his desk. 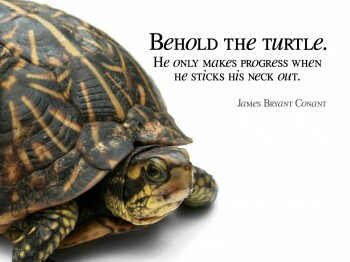 It had a picture of a turtle and read: “Behold the turtle: He only makes progress when he sticks his neck out.” That poster and its message did not make as much sense then as it does now! When I look back at my rather eventful, yet tumultuous at times career, I feel the learnings from those 100 days have been crucial in molding me as a business leader. I gained nothing materially from that misadventure. But I gained a wholesome experience and key learnings which no B-school or no straight-jacketed job could have ever taught me. The ability to travel internationally without even pausing to get over jet lag, the daring to cold call on global industry leaders, the nuances involved in documenting joint-venture agreements, the art of business planning, the intricacies involved in building and leading a team, and, of course, of inspiring them to share a vision and destiny __ all these learnings came from that aborted project. In the immediate aftermath of the project’s demise, none of this was apparent to me. But over the years, when I look back at various events and opportunities that followed, I am certain that without that DTH project’s sharp, and incorrigibly condensed, learning curve, I would not have been able to deal with many of them. Life’s essence is not in its predictability as I have discovered. Its essence is always in the learning that follows each test that she gives us first. And no test, even if you fail at it, is a wasted effort. Each one is an opportunity to learn, grow and evolve! Life may not always make you rich, but each experience in Life will, undoubtedly, leave you enriched!